Three and a half years ago I posted a research note describing the Redstone Rig, a simple bracket to attach a small camera to a kite or balloon line. I have used a 3D printer to make more than a hundred Redstone Rigs, many of which are prototypes which still litter my office. The design files have been freely available on Thingiverse and have been downloaded hundreds of times. I don't know how many have been printed by others. Above: The new Redstone Rig 2.0 is distributed as a kit that now requires no drilling, cutting, or gluing. It can be assembled and balanced for your camera in less than an hour. 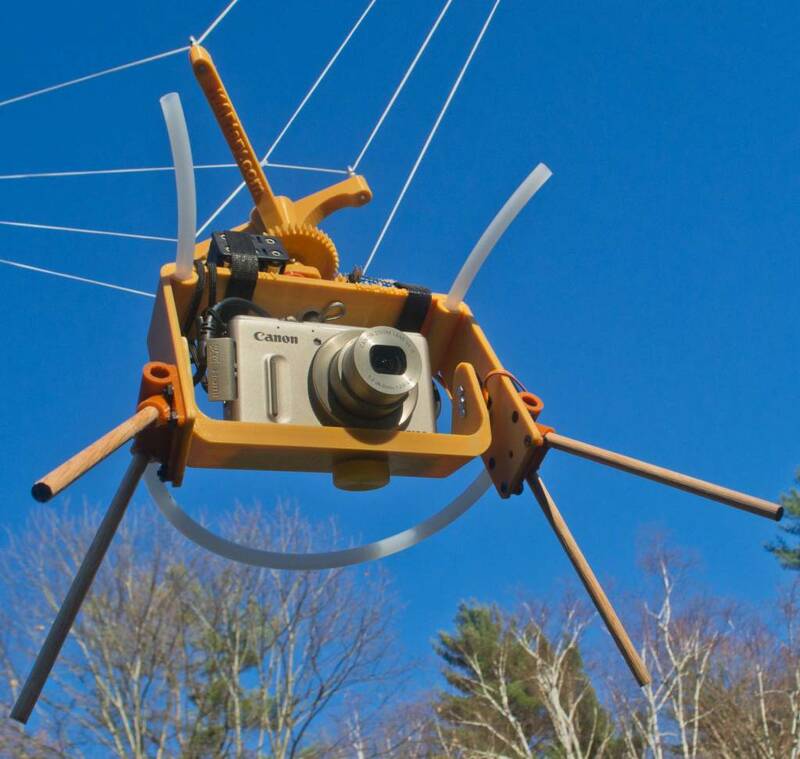 Last summer Autodesk supported Ranon Pritchard as an intern at Public Lab working on the design of aerial photography tools. Ranon got me started using Autodesk Fusion 360, a high end CAD program, and helped me work through redesigning the leg bracket of the Redstone Rig. I slowly caught on to Fusion 360, and this spring finally finished redesigning all the parts of the Redstone Rig. I did not start from the old designs but built each one from scratch incorporating new ideas about how they should work. 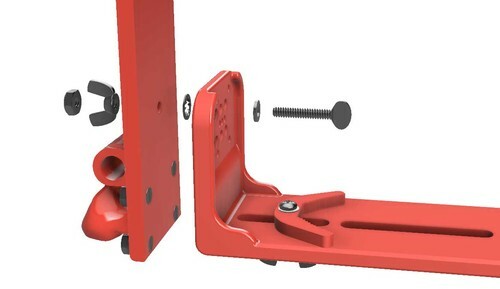 Above: Several new features of the camera tray allow almost any small camera to be mounted perfectly balanced under the suspension without drilling any holes. The biggest design improvement with Redstone 2.0 is that cameras can be mounted on the rig without drilling a custom hole in the camera tray. A universal camera tray replaces three different tray models and allows any small camera to be quickly mounted so it is balanced side-to-side and front-to-back. The new system works great for point & shoot and many mirrorless cameras. There are more details about this design advance in this article at the KAPtery. As always, the design of the Redstone and all KAPtery rigs is open and the files to print your own are downloadable from Thingiverse. Above: The new Redstone Rig is stronger because of some strategic design elements and also because it contains about 20% more plastic. Kits to build a Redstone Rig are now available at three places. The Public Lab Store sells kits to build all four KAPtery aerial rigs plus some accessories. For shipping to US addresses try either the Public Lab Store or the KAPtery, and the Public Lab Store also does international shipping. In Europe, the best place to order a Redstone Rig and suspension is Ennapurna, a store loaded with fun beach equipment and kites including a page of good lifting kites for KAP. Note that the product descriptions of the Redstone Rig at the Public Lab Store and Ennapurna still include some old photos of the original Redstone Rig (hint, hint), but new orders will be for the new Redstone Rig 2.0. I have a some inventory of the original Redstone Rig Kits and I have reduced the price at the KAPtery by about 40%. Package deals allow you to buy kits to make a Redstone Rig and a Picavet or pendulum suspension for $40.00 or less. I will lose money on these sales, but that is turning out to be an integral part of the KAPtery business model. 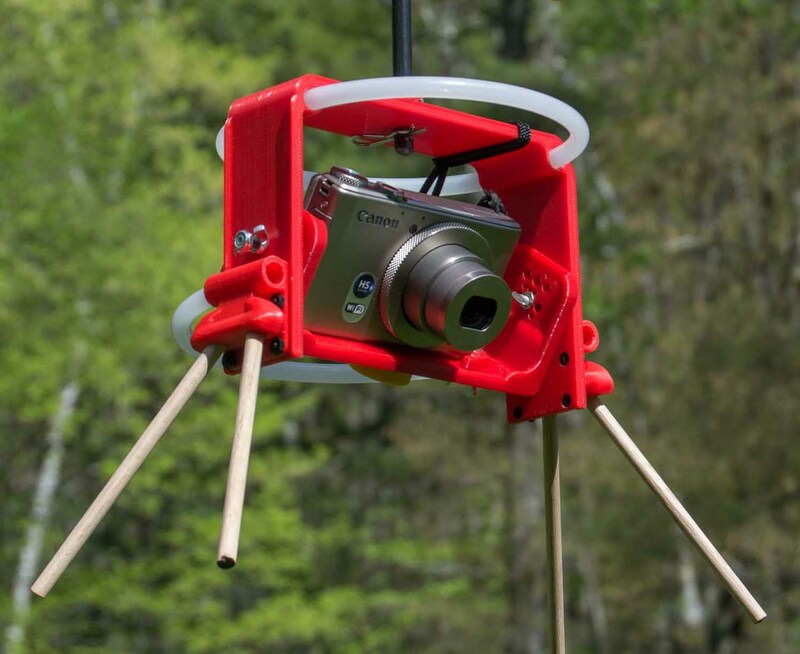 Above: This package with Canon ELPH 135, Aerobee Rig, and pendulum suspension is on sale for $118.00 including US shipping. CHDK is installed on the camera and most assembly is done. To make it a real Summer Sale, the prices of all the assembled packages with camera, rig, and suspension are also on sale at the KAPtery. Several models of Canon PowerShot (S100, S110, ELPH 135, A1400) are included in ready-to-fly rigs for bargain prices. Because of smartphones, small PowerShots are no longer commodity items and are hard to find in both good condition and for good prices. Most of the cameras in these rig packages are not used but were purchased from Canon as factory refurbished. They are in pristine condition with new batteries and accessories, but are no longer available as refurbs from Canon. These camera packages will be the last offered by the KAPtery until the market shifts and provides a similar opportunity for value. Above: This package with Canon S100 and assembled Saturn V Rig is on sale for $317.00 including US shipping. It includes a SkyShield autoKAP controller, two servos, all the cables, and is programmed and ready to fly. The S100 has integrated GPS. Good work, Chris. Thanks for all you've done to advance use of these techniques. Thanks Pat. And thanks for your comment and support 3.5 years ago when I posted the first Redstone note. Some things never change. Real cool Chris! Glad to see these advancing. I love the new adjustable-mount position tray.